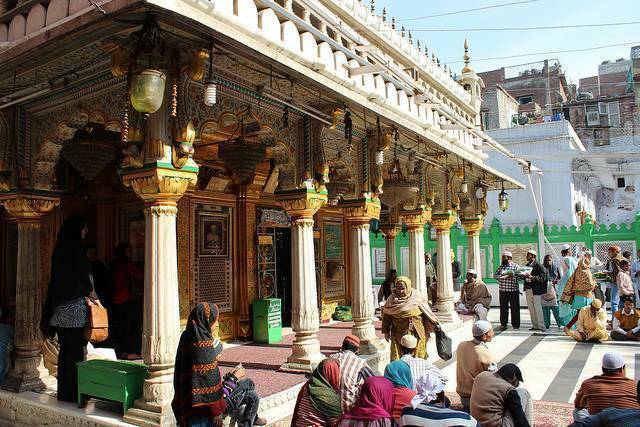 Nizzamuddin Dargah, the shrine of Hazrat Nizzamudin, is one of the most fascinating places in Delhi. Constructed in 1562, the tomb is topped with an onion-shaped dome and is covered with intricate paintings. The tomb of Begum Jahan Ara and Mirza Ghalib & Amir Khusrow are also housed inside the dargah complex. Situated opposite the Humanyun tomb, the Dargah is booming with colorful festivity, music and Islamic celebrations at all times. The best time to visit is Thursday evening every week when you can find live qawalli session (ecstatic devotional Muslim songs) in progress. The narrow lanes that lead to the shrine resound with melodies and are crowded with entranced pilgrims that visit the dargah with great faith and devotion in their hearts. Lined at the sides of these narrow lanes are street hawkers selling meat-based meals, tiny shops selling Urdu-language books, CDs and various other holy artifacts. Filled with historic stories, the Nizamuddin Dargah offers a soul satisfying spiritual experience and can be visited anytime from 4 AM to 8 PM throughout the week.